Arthur A. Dailey was a remarkable man - an artist behind the camera who can fill walls with prizes and awards from international photographic salons, an ad professional who was for more than 30 years close friends with Leo Burnett, the father of the modern ad industry, a business man who attracted people like Walt Disney through his excellence, the original creator of the Lucky Luke cowboy character, a wrangler and seasoned dude and buddy to artists like E. William Gollings, the famous painter of the American West, and Joe De Yong, the only apprentice to the great cowboy artist, Charles M. Russell. 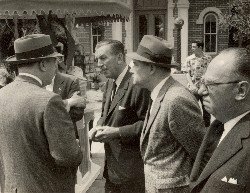 "Mike (meaning Arthur Dailey) is one of the toughest advertising managers I have ever known or worked with - and I've known some dandies. And that's one big reason, believe it or not, why I like Mike." - Leo Burnett on the occasion of Arthur Dailey's retirement from Santa Fe Railroads, November 27th, 1963. 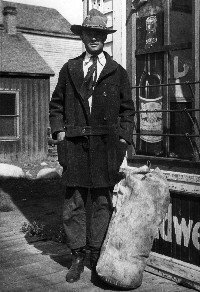 Arthur Dailey was at “home on the range.” Born in Omaha, Nebraska, he spent nearly sixty years (1912-1972) returning to Eatons' Ranch in Wolf, Wyoming where he held every job from waiter to wrangler and later was a seasoned dude. It was in the Bighorn Mountains that Dailey began shooting from the saddle. Each photo is a piece of art and many are iconic images of the American West. "Arthur Dailey's show was something else. Here was a visual presentation of 16 x 20 prints in full color ... an entire room full of masterful prints ... you just had to come up for a close look to convince yourself they were not paintings. Our day was made, for we had come upon a new name, a great talent ..."
- Jose Izuela in an article from Arizona Highways, October 1971. "Photographs by Dailey are truly art." - J. Douglas Hale, associate professor of art history at Arizona State University, 1971. We have selected from about 600 photos in Arthur's collection some of the very best, many of which won prizes and were exhibited nationally and internationally in photographic salons all over the world, from America to Australia and from Sweden to Chile and Argentina. You can purchase prints and digital images of many of these magnificent photos in the Museum Shop. But please keep in mind that all of these photos are rights managed. For any commercial or public use please contact us to inquire for a license. As a teenager at Eatons’, Arthur Dailey learned the love of horses and how to photograph them in action and at rest. Photography was only a hobby then. Upon graduating from the University of Illinois, Dailey joined Eastman Kodak Company as a copywriter. When his boss saw the photographs that Arthur had taken, he transferred him to the photography department. It was there that Dailey learned and began to develop his extraordinary technique. This training stood him in good stead when he traveled the world with his camera in the twenties. He sold his works to such publications as National Geographic, Saturday Evening Post and other magazines, newspapers and travel publications. During this period he also made a series of camping and trail riding photographs for Kodak’s advertising program. In the depression years he photographed a myriad of subjects – babies and children, Big Ten football teams in action, and fashion models. 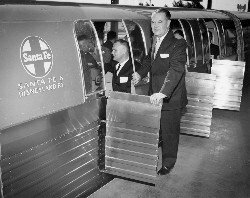 In the late ‘30s, Arthur Dailey took charge of the massive advertising program for the Santa Fe Railway system. The records reveal many national awards won for his Santa Fe ads and billboards which were familiar throughout this country. Several years before he retired from the Santa Fe in 1963, Dailey began exhibiting his black and white photographs in international photographic salons on all continents. His images won top awards – gold, silver and bronze medals and blue ribbons and trophies – at virtually every exhibition he entered. It was only after retiring that Pete could devote full time to photography. In the late ‘60s, he branched into color and used it to depict the Western story. He was most intrigued, still, with the drama of horses churning up the dust as they ran freely in the hills and mountains and across the plains. In his search for perfection, Arthur was known to return repeatedly week after week to a location until the light and action were just right for the image he sought. Unlike most photographers, he tripped his shutter only once for each composition, and almost every picture he took was a winner. For more on Arthur A. Dailey please take a look at the ebook Arthur Dailey - Photographer Extraordinaire . All text and photos of the Arthur A. Dailey collection is © by Mary Dailey and Deep Blue LLC. These are the five first original Lucky Luke stories (radio scripts) that Arthur A. Dailey wrote. They aired from WBBM Air Theatre in Chicago in 1934 and were heard on many other stations throughout the continental United States. This is negative #532 in the 'Arthur A. Dailey Collection'. Its size as a 16" x 20" print is 11.1" x 20". Its size as a digital image is 2319 x 1285 pixels. This is a rights managed image. With the purchase of this digital image you are acquiring personal usage rights. That is you can print it out to put the print on your wall, or use it as screen saver or wallpaper on your computer monitor. You are not permitted to sell or give away the digital file or any prints. Any commercial or public use requires a separate license. Please contact us for further information. This is negative #1 in the Arthur A. Dailey Collection . Its size as a 16" x 20" print is 11.3" x 20". Its size as a digital image is 1687 x 936 pixels. This is negative #5 in the Arthur A. Dailey Collection . Its size as a 16" x 20" print is 11" x 20". Its size as a digital image is 2446 x 1528 pixels. This is negative #6 in the Arthur A. Dailey Collection . Its size as a 16" x 20" print is 16" x 17.5". Its size as a digital image is 2395 x 2622 pixels. This is negative #8 in the Arthur A. Dailey Collection . Its size as a 16" x 20" print is 13.6" x 20". Its size as a digital image is 4754 x 3000 pixels. This is negative #86 in the Arthur A. Dailey Collection . Its size as a 16" x 20" print is 14.6" x 20". Its size as a digital image is 3000 x 4113 pixels. This is negative #100 in the Arthur A. Dailey Collection . Its size as a 16" x 20" print is 12.7" x 20". Its size as a digital image is 3480 x 2208 pixels. This is negative #192 in the Arthur A. Dailey Collection . Its size as a 16" x 20" print is 16" x 17.4". Its size as a digital image is 2232 x 2766 pixels. This is negative #275 in the Arthur A. Dailey Collection . Its size as a 16" x 20" print is 16" x 18.6". Its size as a digital image is 2112 x 1818 pixels. This is negative #300 in the Arthur A. Dailey Collection . Its size as a 16" x 20" print is 16" x 19.8". Its size as a digital image is 3000 x 2426 pixels. This is negative #383 in the Arthur A. Dailey Collection . Its size as a 16" x 20" print is 10.8" x 20". Its size as a digital image is 2445 x 1315 pixels. This is negative #476 in the Arthur A. Dailey Collection . Its size as a 16" x 20" print is 11" x 20". Its size as a digital image is 2868 x 1572 pixels. This is negative #528 in the Arthur A. Dailey Collection . Its size as a 16" x 20" print is 13.8" x 20". Its size as a digital image is 2832 x 1500 pixels. This is negative #546 in the Arthur A. Dailey Collection . Its size as a 16" x 20" print is 13.2" x 20". Its size as a digital image is 3000 x 1974 pixels. This is negative #549 in the Arthur A. Dailey Collection . Its size as a 16" x 20" print is 16" x 19.8". Its size as a digital image is 3000 x 2430 pixels. This is negative #552 in the Arthur A. Dailey Collection . Its size as a 16" x 20" print is 13.8" x 20". Its size as a digital image is 3000 x 2066 pixels. This is negative #553 in the Arthur A. Dailey Collection . Its size as a 16" x 20" print is 14.3" x 20". Its size as a digital image is 3000 x 2140 pixels. This is negative #554 in the Arthur A. Dailey Collection . Its size as a 16" x 20" print is 15.7" x 20". Its size as a digital image is 1721 x 1351 pixels. This is a collection of articles, some written about and some written by Arthur Dailey. They give a flavor of what kind of person Arthur was. There are many extraordinary things one could say about Arthur, ranging from his magnificent photographs to his work as advertisement man. But perhaps the best way to understand Arthur is to examine the company he kept. Friends like Leo Burnett, the father of the modern ad industry, artists like E. William Gollings and Joe De Yong and researchers such as Elmo Scott Watson.